What are the United Buddy Bears? The United Buddy Bears are many things. They are fiberglass bears over six feet tall which are painted by artists from nations all over the world. They are canvases to showcase the creativity, national pride, and spirit of people from over 120 countries. The United Buddy Bears carry an important message about the need for global peace, tolerance, and friendship. Since 2002, US $2.4 million has been raised for charity organizations. 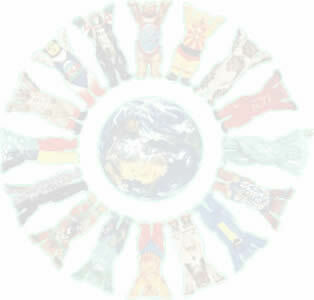 In each city where the United Circle of Buddy Bears is shown, activities (e.g. auctions) raise money for children in need. At the end of the world tour and in-between the bears will be sold by charitable auction for UNICEF and other organizations helping needy children all over the world. When Jackie was in Berlin, Germany filming Around the World in 80 Days, he discovered the United Buddy Bears. At the time, there were Buddy Bears all over the city of Berlin. Jackie became curious about the colorful bears and did a little research. He found out that the bears were the brainchild of Berlin residents Eva and Klaus Herlitz. He learned that they were meant to carry an important message - a message that he too had been working hard to deliver: we must live together in harmony and peace. He also found out that the Buddy Bears raised money for charity. Jackie became hooked on the Buddy Bears! How did all of these Buddy Bear drawings end up on the Kids Corner? 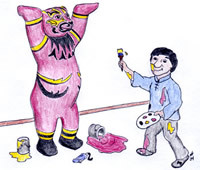 Well, when Jackie got involved in bringing the United Circle of Buddy Bears to Hong Kong in 2003, the creator of the Buddy Bears project contacted us and we discussed the idea of posting the blank Buddy Bear outlines on our website for kids to decorate. The idea took off and now there are hundreds of Buddy Bear designs at Jackie Chan Kids Corner! Below are links to all kinds of cool and interesting things related to the Buddy Bears. Click the bears to visit all the different Kids Corner pages devoted to the United Buddies!